The exhibition features a selection of ancestral portrait paintings and popular prints that traditionally were part of Lunar New Year observances and celebrations in Chinese households. The Royal Ontario Museum (ROM) in nearby Toronto is pleased to present the ROM-original exhibition Gods in My Home: Chinese New Year with Ancestor Portraits and Deity Prints. Drawn from the Museum’s permanent collection, the exhibition features a selection of ancestral portrait paintings and popular prints that traditionally were part of Lunar New Year observances and celebrations in Chinese households. Opening on Jan. 26 to coincide with the widely-celebrated holiday, Gods in My Home explores the connections between the domestic, material and spiritual life of Chinese society. Gods in My Home comprises over 100 objects spanning the late Imperial period to the early 20th century Republic era. With a focus on ancestral paintings and popular prints of deities, the exhibition explores the connection between these two seemingly separate genres. Chinese families believed that the presence of these images both blessed and protected the family lines. In traditional Chinese culture, celebrating the New Year was not only a time to worship gods and divinities, it was also a time to commemorate family lineage. 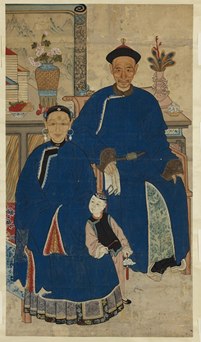 The exhibition includes nine large ancestor portraits, commissioned by prosperous families, as well as printed ancestral scrolls that were more affordable. The popular print pieces, created on ordinary paper and pasted on walls and doors, served as religious talismans to ward off evil spirits and bless the family home. Many of these prints were considered common objects when first collected by the ROM in the early 1900s, and are now considered important cultural objects that illuminate the domestic beliefs and famly values inherent in Chinese life. The exhibition is accompanied by a full-color illustrated catalogue published by the ROM. The publication is generously supported by the Louise Hawley Stone Charitable Trust. For more information, visit https://shop.rom.on.ca/a525/gods-in-my-home-chinese-ancestor-portraits-and-popular-prints.html. Gods in My Home is on display on Level 4, Patricia Harris Gallery of Textiles and Costumes, and included with Museum admission. Be the first to comment on "Ring in the Chinese New Year at the Royal Ontario Museum"